Walk 002. Simon Lee Dicker, artist. Cut to 5.30 am on March 10th and I’m leaving Bath in an amber weather warning to get to OSR Projects at West Coker for the 6.36 sunrise. Had I gone with Simon’s next available date of April 28th I’d have already been on the road for a pre-6am start. A slight diversion (presumably caused by a downed tree) meant that I arrived by the light of early dawn – the sun wasn’t yet visible, but the sky was illuminated. I apologised as I filled my water bottle and donned by fleece hat, but I soon learned that Simon’s sunrise stipulation wasn’t really about catching the sun as it rose over the grid of fields to the east and south, through Dorset, Hampshire, and beyond. The benefits of dawn walking are similar to those of dawn writing – setting off at dawn means starting out with a clear head, yet to be crowded by the day’s events, encounters, and considerations. Then there’s the solitude. Looking out across a landscape stirring from its slumber. The odd farmhouse with bedroom and bathroom lit, and then the kitchen. We know the comfort and cosiness of a warm Sunday morning. Low lighting, sweet tea, the radio or Countryfile on the telly, the papers (does anyone still do that?) but we choose to be out here with our daypacks on our backs, filled with trailmix and coffee. 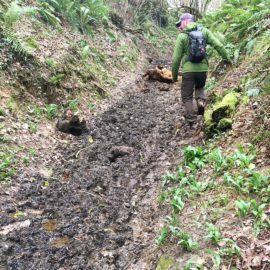 We passed through fields in whose eastern corners nighttime lingered and crossed silent lanes, or holloways – the sunken lanes engraved out of southern Somerset’s shallow valleys. 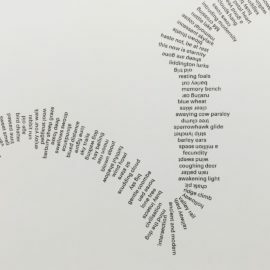 Early talk centred around Simon’s self-described ‘restless practice’ – his work takes many forms, from drawing to organising a mass silent wild swim at last year’s Jamboree Festival. 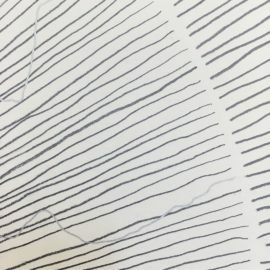 I first encountered Simon as a facilitator of other artists’ work, rather than as an artist in his own right, and we spoke about some of those projects – the work experience girl he hosted, whose review of an exhibition I recalled reading, and who is now away at university on an arts degree. We talked about last year’s Od Arts Festival, which he co-curated with Bob Gelsthorpe. Simon expressed great joy in enabling others and the frustration of not being able to get around and see everything that he had enabled! We also discussed parenting – Simon’s children are about five or six years older than mine – how the anxieties that come with it never really let up, while the rewards, which come in waves, are ever-changing in their nature and scale. It’s easy to talk about parenting (or life in general, if parenting isn’t relevant) as the real world and art as something else, but that position also feels like kind of a cop-out. It implies we shouldn’t take art seriously. For art professionals like Simon, and aspiring ones like me, art is the real world – it is a vocation, a calling, a lifetime of passion and toil. It’s a bit self-indulgent, but so is golfing, and spending all weekend in the kitchen mastering your meringue. I don’t think mine and Simon’s discussion got to this, but these are all thoughts I’ve had since our walk. As we entered the grounds of the National Trust’s Montacute House we ignored the sign advising us to give the trees a wide berth (remember that amber weather warning) and agreed to be vigilant in case of falling branches. 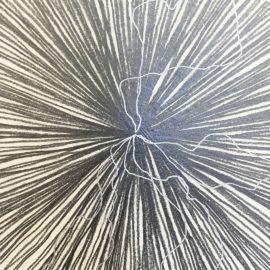 Conversation tipped back into non-art life as we discussed an encounter I had the day before with a road-enraged pedestrian and how (thankfully) few and far between violent confrontations have been in our lives. Our walk took us to the top of St. Michael’s Hill and up its tower, through which the winds howled and carried away our words before we could speak. Simon pointed out the route of the River Parrett, which rises in nearby Cheddington in Dorset and meanders gently to Bridgewater Bay, on the North Somerset coast. 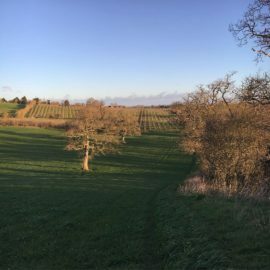 One of Simon’s earliest projects after moving here from London in the early 2000s was a walk along the River Parrett Trail, a project which allowed him to gain a foothold in the landscape while simultaneously meeting and talking with residents. 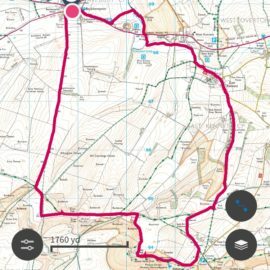 Our walk continued through some of Simon’s favourite routes, and at regular intervals I was offered the option of taking a route which heads straight back to OSR Projects, or an alternative which took us over a hill / around a copse / up a muddy track but out onto a hillside overlooking the valley, I chose the latter every time. We returned to West Coker at lunch time, our legs feeling every inch of the sixteen miles we had walked. Simon made a coffee and put on the stewp (half stew, half soup) to heat through. At this point our walk was complete, but we were only half way through our day. After an hour or so of discussing other walking artists, books (Simon gave me a copy of Rebecca Solnit’s Wanderlust) about walking, and the current Simon Faithful exhibition at Hestercombe House, we moved into the project space, in which Simon had installed a number of his own projects that either involved or were inspired by walking. The following italicised text is from my original Instagram post a day or two after our walk. 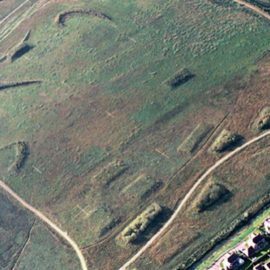 ‘Landlines’ (2004) saw Simon mow the invisible geographical lines of the British National Grid into the grass of a public park, creating a temporary earthwork. 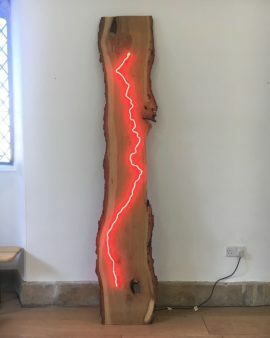 ‘Escape from the Blackdown Hills’ (2012) led to this mixed media piece in which the walked route is imposed in neon over the intended route, which is drawn onto the wood in pencil. The wood itself is sourced from the location in which the walk occurred. 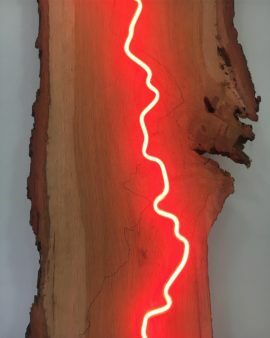 Throughout the walk Simon’s gaze was fixed on a bright red beacon on the horizon, which comes through in the neon of the final piece. 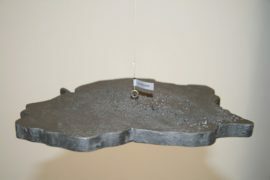 For the second piece inspired by ‘Escape from the Blackdown Hills’ Simon used ship-building techniques to find the theoretical centre of the Blackdown Hills in Somerset, and then completed eight ‘escapes’, which were recorded by GPS device. 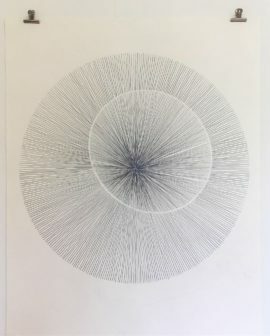 The drawing combines data taken from those walks combined with the solar calendar – each line, drawn outwards from the centre, represents a day of the year. The distance from the centre of the image to the break in each line, forming an off-centre oval shape, represents hours of sunlight. 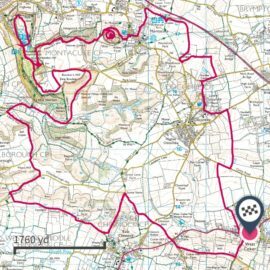 Finally, in the detail image, you can see some of the walked routes that Simon took, between sunrise and sunset. It was an absolute pleasure to walk with Simon, and the two hours we spent talking about his work afterwards were just as rewarding. Simon reminded me that when I met up with him in 2017, to write about his work at Cotley Tithe Barn, I had expressed a desire to return to drawing. 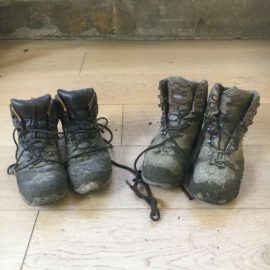 I had not yet made good on that desire, but in the two weeks since our walk I have picked up my pencil and am back at it – lying on the floor for hours like I did when I was boy. It hurts a bit now, but it feels great to be drawing again. 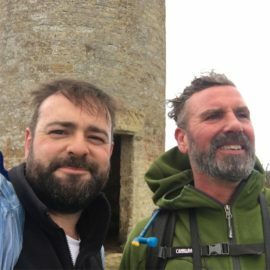 I hope our walk was mutually beneficial, in that it offered Simon the opportunity to gather together some of his projects and discuss them in relation to each other and his wider ‘restless’ practice. My next post will reflect more directly on the early outcomes of Walks With Other Artists. All images of artworks courtesy of Simon Lee Dicker. Richard and I discovered each other’s work via Instagram. I think I was scrolling through the #walkingartist hashtag and found images of the Ridgeway, Britain’s oldest road. Or maybe he was, I don’t remember, but it’s all there on Instagram somewhere. The Ridgeway runs partially through Wiltshire, which is my neighbouring county, so I figured that Richard might be an artist I could walk with. It transpired that Richard and I are both MA students at the same art school in Bristol, so my original thought was that we would meet there and chat about our projects. After a brief email exchange it became obvious that the best thing to do would be for me to travel to his home near Avebury, in Wiltshire, to walk a route plotted by him through the landscape that most informs his work. We walked part of the Ridgeway which, at 5000 years old is Britain’s oldest road. 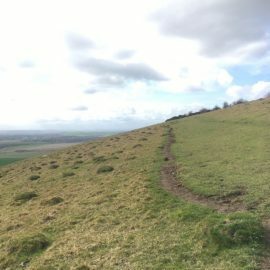 We crossed and then walked along the impressive Wansdyke, a relatively modern earthwork from Anglo-Saxon times, named after Woden. 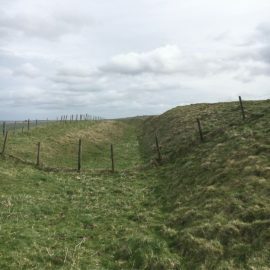 The dyke, similar in design to Offa’s Dyke, is thought to have formed the Mercia-Wessex border in that pre-illuminated age. We talked about the human effort involved in constructing such structures, and the alluring mystery of the Dark Ages. Richard explained to me that Wiltshire was the ‘wild shire’, on account of its vast open spaces. There is much level or even ground here, though this shapely landscape is anything but flat, often falling away steeply or rolling in waves that decrease in scale towards the valley floor. 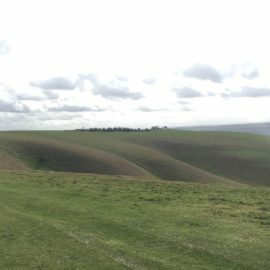 As we came down from Wiltshire’s highest point, Milk Hill, I shared my recent discovery that the greened humps surrounding us were actually overgrown tree stumps, which I learnt on the Pennine Way last year. 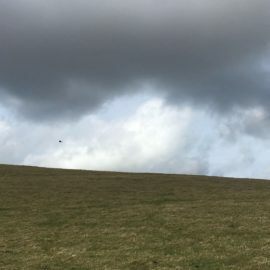 And of course I include my obligatory terrible picture of a red kite riding an updraft. 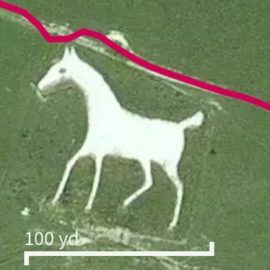 Richard took me to see the Alton Barnes White Horse, whose picture I have chosen not to share, on account of the Ordnance Survey satellite view being much better. 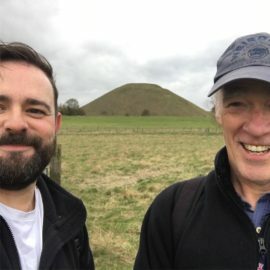 As we headed back to Richard’s home we diverted along the muddiest track my boots have yet seen and stopped for a selfie by the conical Silbury Hill, which I was reliably informed had been so thoroughly excavated during the latter half of the 20th century that its roof had fallen in. 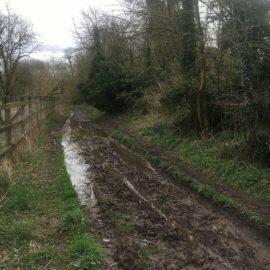 We walked alongside the crystal clear waters of what Richard referred to as the Winterbourne, but the map calls the River Kennet, though it was more a burn (or bourne?) than a river, and ended up back at Richard’s family home where we ate soup and discussed Richard’s work. 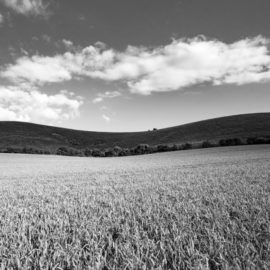 His Photography centres on his experience of the landscape, but for me, Richard’s written account of walking the Ridgeway in both directions was something else – it spoke of walking, and of being within the landscape that inspired it. See more of his work on Instagram @richarddraper38 and his website. Richard brewed a coffee when I arrived at his lovely family home, and baked a loaf of bread, which we ate later with soup and cheese. 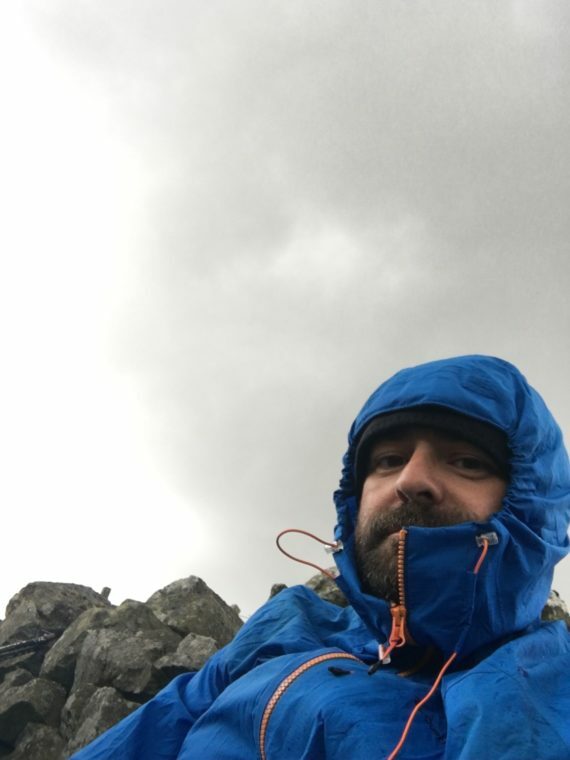 We discussed the temptation of kit, lightweight, flexible, hard wearing etc, but agreed that really the walking is the thing, and it’s difficult to get too carried away by the paraphernalia. I also met their big ginger cat, who was lovely but whose name I didn’t catch. All in all a successful first walk, in which we discussed both Richard’s and my work, the nature of our chosen mediums, the difficulty with paying to show work, the joy of walking and being able to get away from the world, allowing ideas, thoughts, and feelings room to breathe. We chatted about walking artists and about public speaking. We even discussed our home lives and origins, and what led us to our current situations. We barely approached the big question of the project, ‘what’s the difference between an artist and a non-artist walking the landscape?’ But then maybe that’s the point – made by Anna at the end of our day – answers to that one will emerge as the project progresses, and maybe I should be walking with non-artists too! This write-up was originally posted on Instagram here, and here. I’ve essentially re-posted my Instagram post here, because to a greater extent than ever, now that I have separated my personal life and my art work on there, it seems to be the place that I do my thinking. There and out walking, that is. I’ll be writing about this soon, as well as posting about Walk 002 with Simon Lee Dicker, this Sunday.